"This attack by the federal government on religious freedom in our country must not stand and will not stand." So said John Boehner in a speech on the House floor -- on Feb. 8, 2012. It was the rhetorical high point of his speakership. "My colleagues, in recent days, Americans of every faith and political persuasion have mobilized in objection to a rule put forward by the Obama administration that constitutes an unambiguous attack on religious freedom in our country," Boehner said. "This rule would require faith-based employers, including Catholic charities, schools, universities, and hospitals, to provide services they believe are immoral," he said. "Those services include sterilization, abortion-inducing drugs and devices, and contraception. "In imposing this requirement," he said, "the federal government has drifted dangerously beyond its constitutional boundaries, encroaching on religious freedom in a manner that affects millions of Americans and harms some of our nation's most vital institutions." "If the president does not reverse the department's attack on religious freedom," Boehner said, "then the Congress, acting on behalf of the American people and the Constitution that we are sworn to uphold and defend, must." But Boehner's Republican-controlled House did not stop this attack on religious liberty. Four months after Boehner gave his speech on the House floor, the Catholic bishops of the United States unanimously adopted a statement describing the Obamacare sterilization-contraceptive-abortifacient regulation as an "unjust and illegal mandate." It was, they said, "a violation of personal civil rights." "The HHS mandate creates still a third class, those with no conscience protection at all: individuals who, in their daily lives, strive constantly to act in accordance with their faith and moral values," said the bishops. "They, too, face a government mandate to aid in providing 'services' contrary to those values -- whether in their sponsoring of, and payment for, insurance as employers; their payment of insurance premiums as employees; or as insurers themselves -- without even the semblance of an exemption. This, too, is unprecedented in federal law, which has long been generous in protecting the rights of individuals not to act against their religious beliefs or moral convictions." To remedy this problem, Rep. Diane Black of Tennessee introduced H.R. 940, the Health Care Conscience Rights Act. As summarized by the Congressional Research Service, this bill would amend the Obamacare law "to declare that nothing in such title shall require an individual to purchase individual health insurance coverage that includes coverage of an abortion or other item or service to which the individual has a moral or religious objection, or prevent an issuer from offering or issuing, to that individual, individual coverage excluding such item or service." The bill would also prevent the government from forcing an employer "to sponsor, purchase, or provide such coverage, or a health insurance issuer or group health plan sponsor to cover an abortion or other item or service to which the sponsor or issuer has a moral or religious objection." The Health Care Conscience Rights Act would stop the attack on religious freedom Boehner vowed to stop in his 2012 floor speech. On March 8, 2013, Cardinal Sean O'Malley, archbishop of Boston and chairman of the U.S. Conference of Catholic Bishops Committee on Pro-Life Activities, sent a letter to members of the House. "I urge you to support H.R. 940, and to help incorporate its policy into upcoming 'must-pass' legislation," Cardinal O'Malley said. On Sept. 26, 2013, Cardinal O'Malley joined with Archbishop William Lori of Baltimore, chairman of the U.S. Conference of Catholic Bishops Committee for Religious Liberty, to send the members of the House another, more specific, letter. "We have already urged you to enact the Health Care Conscience Rights Act," the bishops told the members. "As Congress considers a Continuing Resolution and debt ceiling bill in the days to come, we reaffirm the vital importance of incorporating the policy of this bill into such 'must-pass' legislation." For 16 days in October 2013, the Republican-controlled House tried to stop Obamacare through the must-pass federal funding bill. Then they stopped trying. Obamacare remains in place and so does its sterilization-contraception-abortifacient regulation. As reported by the Becket Fund for Religious Liberty, seven sets of plaintiffs are now petitioning the Supreme Court to take up their lawsuits seeking to stop the government from forcing them to act against their faith. They range from the Little Sisters of the Poor to Houston Baptist University to Roman Catholic Bishop David Zubik of Pittsburgh. The issue: Can the government compel Americans to act against their conscientiously held moral and religious beliefs -- even to the point of forcing them into complicity with the taking of innocent life? 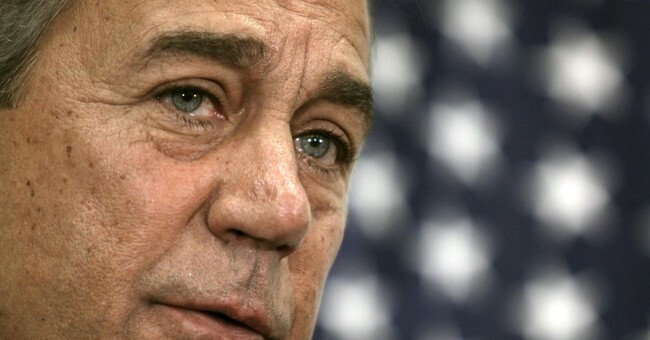 Speaker John Boehner did not lead Congress in stopping the government from doing this. Now it may be up to Justice Anthony Kennedy.